Whether it’s broken, fogged or looking to upgrade your existing storefront. We have the experience to repair, replace or upgrade your storefront doors and windows. We understand that keeping your facility secure and operational is critical to your business. We offer quick, reliable and efficient service for you to continue to serve your customers through the process. 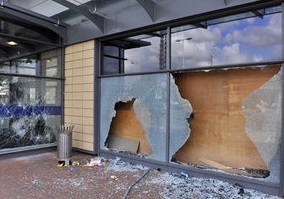 Let All Service Glass handle your commercial storefront repair today! Our licensed glaziers at All Service Glass recognize that your business can become victim to theft, car accident, extreme weather conditions or other unforeseen occurrences which may demand immediate attention. Same day repair and board up service is available in those emergency situations. If the broken glass requires safety tempered or double pane insulated glass, it may take longer for manufacturing. When customers visit your business, it is important that your storefront looks clean, professional, and credible. A large part of your company’s image is influenced by the quality of your storefront, as it’s what customers interact with when they visit you to conduct business. Commercial storefronts with faulty doors, cracked glass, foggy windows, and rusty door closures can be deterrents for customers, giving your business an unpolished look, which can give people the wrong idea about the credibility of your company. No matter the current condition of your commercial storefront, All Service Glass has the knowledge to elevate the look of your business and help promote a renewed image. Specializing in commercial storefront repairs and replacement, All Service Glass has developed a strong reputation for excellent customer service and competitive rates. Are you looking for a reliable storefront contractor? Whatever your specific commercial storefront repair need is, you can expect a licensed storefront contractor to resolve your issue quickly, without compromising quality of service. All Service Glass only offers the highest quality materials are used, and the job is not complete until you are satisfied.